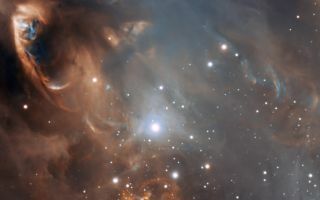 This very detailed enhanced-colour image from ESO’s Very Large Telescope shows the dramatic effects of very young stars on the dust and gas from which they were born in the star-forming region NGC 6729. This very detailed space wallpaper from ESO’s Very Large Telescope shows the dramatic effects of very young stars on the dust and gas from which they were born in the star-forming region NGC 6729. The baby stars are invisible in this picture, being hidden behind dust clouds at the upper left of the picture, but material they are ejecting is crashing into the surroundings at speeds of that can be as high as one million kilometres per hour. This picture was taken by the FORS1 instrument and records the scene in the light of glowing hydrogen and sulphur.